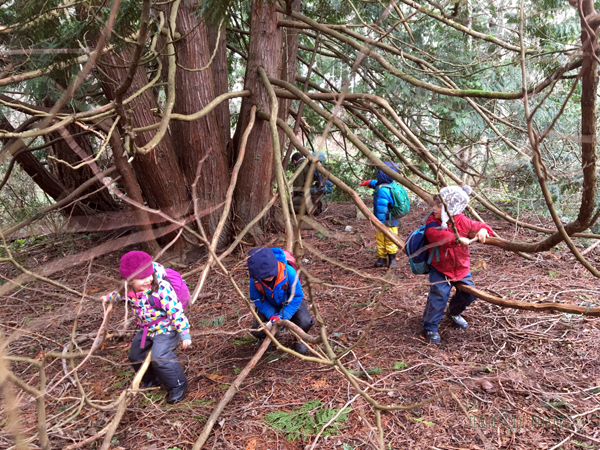 Week 14 + 15 | Fox Walkers at Fairhaven | Mud, Sun, Cedar Trees and Nature Magic! trailing a deer in the sunshine! What'd you do at school today? a hard working wood spitter! watch your back!" Playing a new student-created and run game. making boats and sending them downstream. and feeling very secure in his muddy buddy! The past two weeks have seen a whirlwind of weather — there were days on end where it didn’t seem to stop raining, sunny patches, whipping 60mph winds and everything in between. 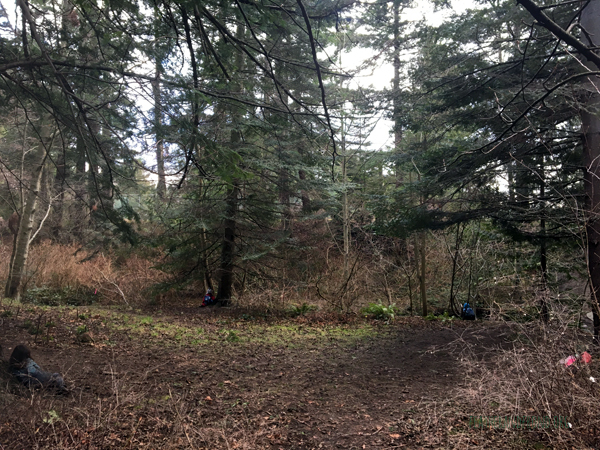 Somehow our Fairhaven Park Fox Walker crew lucked out because it seemed like all 4 days were beautiful and calm. We sure saw a lot of water on the ground, but not a lot from the sky. 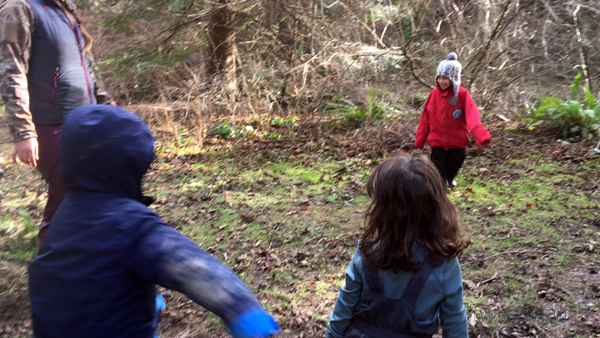 Continuing our focus on trees this month, we had some wild adventures and experienced a heaping dose of Nature Magic! in to upper, lower and tunnel routes! 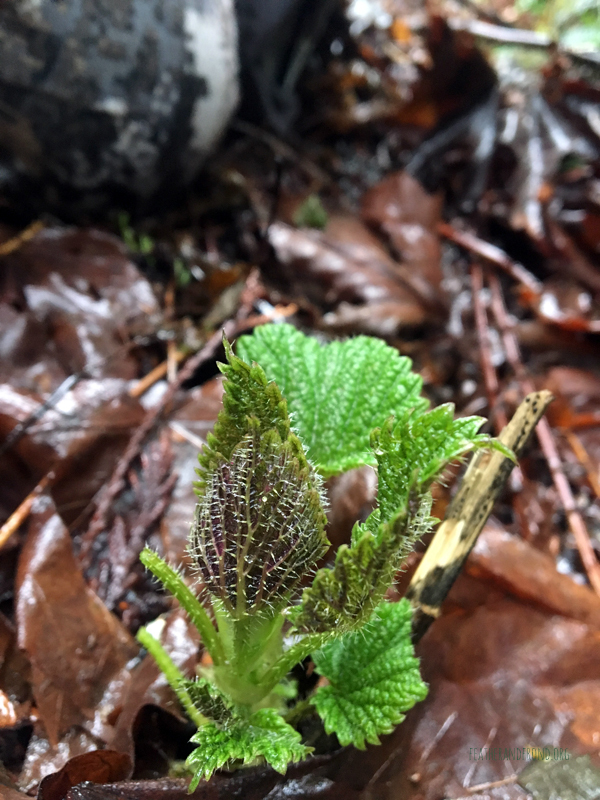 Finding the first nettle shoots! Raw Stinging nettle is delicious if you break up the stinging hairs before popping in your mouth. this one was dubbed the Cedar Dragon! Very early signs of spring. 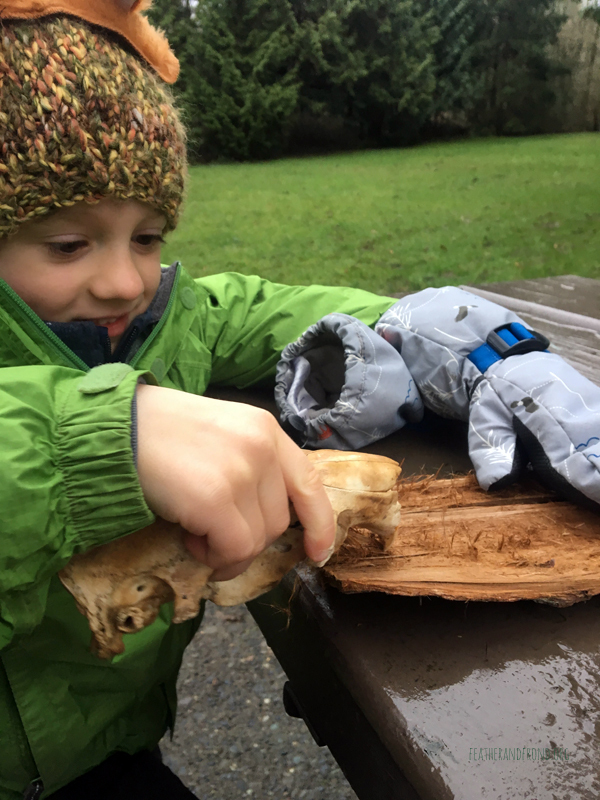 Scraping cedar bark with a beaver skull. or as we call it, "Thursday"
I love the old woman's cedar house and hair! Riding a huge Cedar Horse! This one was a Cedar Orca! ith a proud Mama in the background! We learned how the “bacon-y barked” Doug Fir tree let the mice hide from a big forest fire in her cones and that’s why you can still see the little “mouse butts/tails” sticking out of the cones. 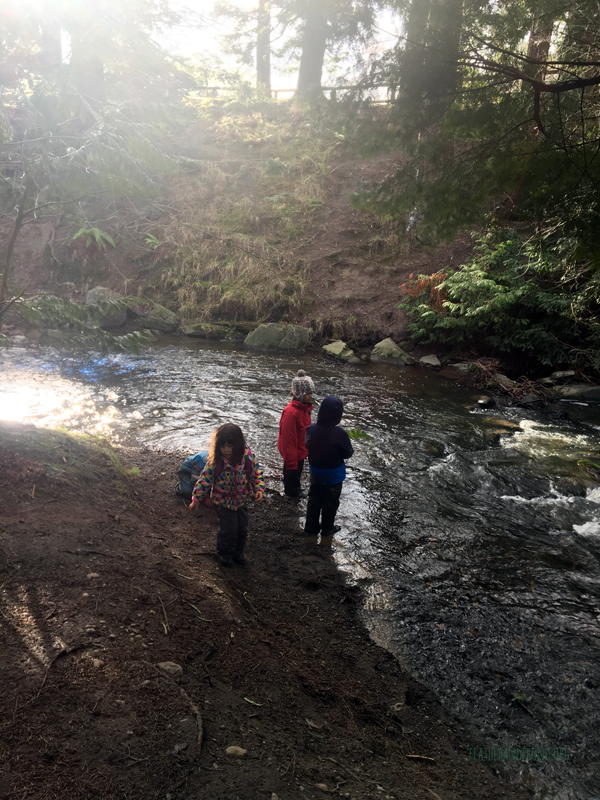 At a new spot we found on the other side of the creek, we made up a game called “Flee, Mousey, Flee”. When the fire yells out “Flee, Mousey, Flee to the next Douglas Fir tree!”, all the little mice have to run through the forest and find a Dougie Fir (Pseudotsuga menziesii) on the fly. This game was a hit and will surely be making another appearance soon. 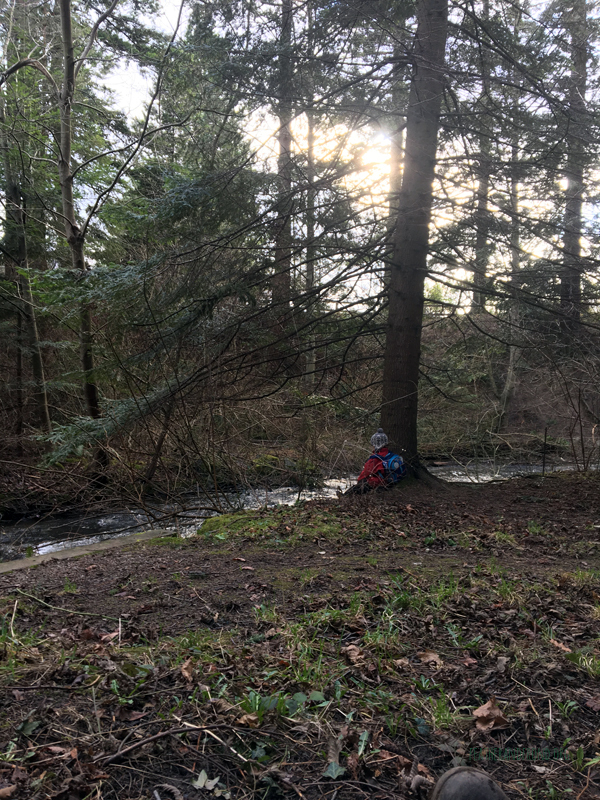 This surely was an inspiring bend in the river because one of the students made up another game that was a lot of fun, called “Tree Whack” as well. We encourage the students to use their imaginations out there and it is always inspiring to see the results. 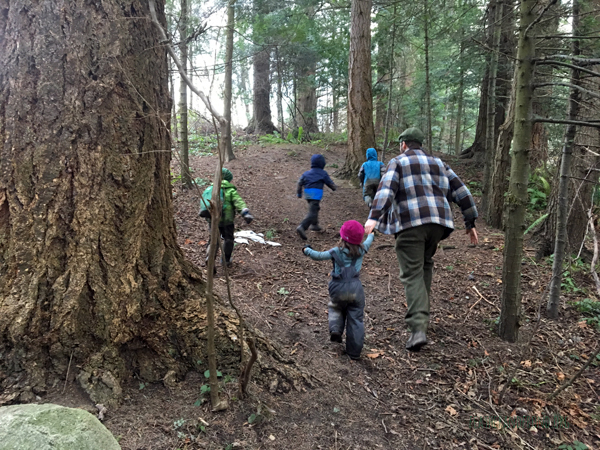 On another sunny day, we were following a deer trail through the large Douglas Firs on an alternate route to Frog Swamp Flats. The tracks looked very fresh and the children were fox walking oh so quietly through the ferns. 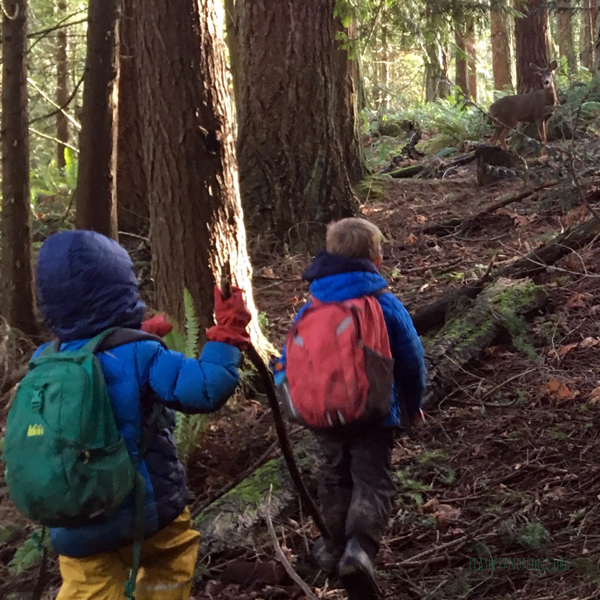 When we climbed a small rocked we looked up and noticed the very deer we were tracking was just ahead of us on the trail! She was turned towards us and really checking us out with her Deer Ears. We shared some very special and magical moments with deer as she walked ahead of us on the trail. Not wanting to scare out beautiful friend, we said goodbye and veered off to north to explore Frog Swamp. At Fox Walkers, Melissa told a wonderful story about man named Thuja who worked very hard and helped others his whole life… Thuja spent long hours in the sun and his skin was reddish-brown and wrinkly, he worked with his hands and they were rough to the touch and scaly. When he died, a cedar tree grew in his place which had reddish-brown wrinkled bark and its leaves were rough and scaly fronds. 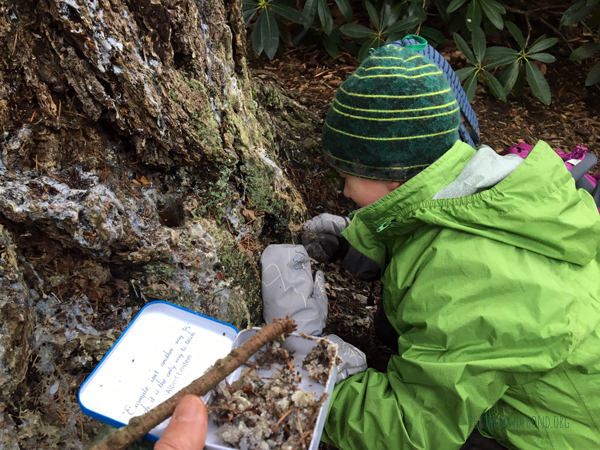 Using these clues, the kids have gotten adept at spotting cedars in the forest! 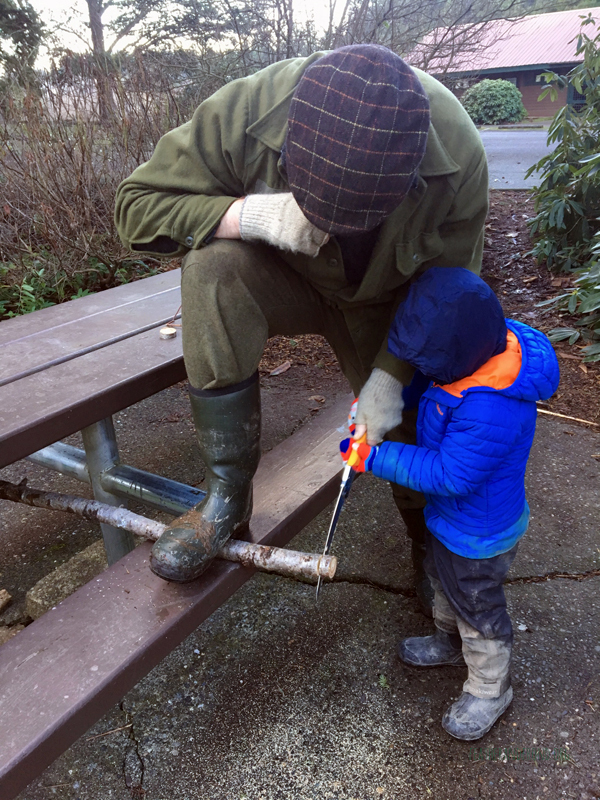 We also have scraped the inner bark together to make tinder bundles for fire, used its sweeping branches to escape the rain and rode the branches like Cedar Horses! We took an epic journey to the “Cedar Highway” in Hundred Acre Wood and it was more magical then mere words can convey! We live in an enchanted landscape and for that I feel blessed. 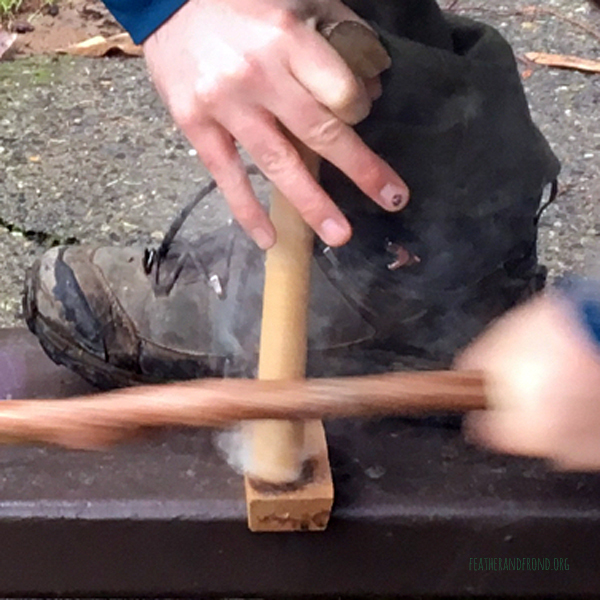 Other highlights of the last few weeks include working hard on Tandem Bow-drill friction fire and getting lots of dark smoke, finding (and tasting) the first “spring” Stinging Nettle growth, building bridges at Animal hotel, and further forging bonds and friendships at program! We have a really special crew here, who knows what magic lies in store!